Bengaluru, June 19 (IANS) Fourteen lawmakers of the ruling Congress are likely to be inducted in the Karnataka council of ministers in the revamping scheduled for Sunday afternoon, a party official said. "The list of new ministers is being finalised by the chief minister (Siddaramaiah) in consultation with the party’s state unit president (G. Parameshwara) and senior colleagues for sending it to the governor (Vajubhai R. Vala) by afternoon for the swearing-in ceremony at 4.00 p.m. in Raj Bhavan," the official told IANS here. Among the probables who might take oath as new ministers are legislative assembly Speaker K. Thimmappa, former Speaker K.R. Ramesh Kumar, Eshwar Kandre, Santosh Lad, Tanveer Sait, S.S. Mallikarjun, Basava Raya Reddy, Ramesh Jarkiholi, Priyank Kharge, Pramod Madhwaraj and M.R. Seetharam. 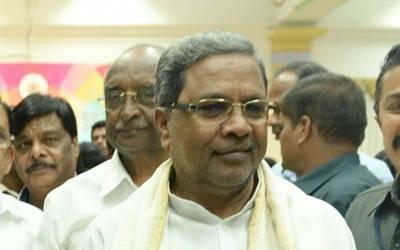 Karnataka has a 34-member ministry, including the chief minister. Among the 14 to be dropped include Srinivas Prasad, Kimmane Ratnakar, Baburao Chinchansur, Qamarul Islam, M.H. Ambarish, Dinesh Gundu Rao, Sathish Jarkiholi, Shamanur Shivashankarappa, P.T. Parameshwar Naik, Vinay Kumar Sorake and S.R. Patil. "The chief minister got approval of the party’s high command for both the lists of new ministers and those to be dropped on Saturday in New Delhi after a detailed discussion with the party president (Sonia Gandhi) and the vice-president (Rahul Gandhi) on Friday," the official said. Congress General Secretary and in-charge of party affairs in the state Digvijay Singh and Parameshwara were present when the list of probables was finalised. The major reshuffle of the three-year ministry comes a week after the Congress won three of the four Rajya Sabha seats and four of the seven seats in the state legislative council’s biennial elections. "The revamp will ensure proportionate representation to all the people across the state, spanning castes and regions," the source asserted. Interestingly, Mallikarjun will replace his father Shivashankarappa from Davangere, while Ramesh will replace his brother Sathish from Belagavi district in the council of ministers. Karnataka is the only major state where the Congress is in power now after the grand old party lost in Assam and Kerala in the recent assembly elections. Siddaramaiah and Parameshwara are hoping the revamp will restore the party’s image, tainted by drought crisis, farmers’ suicides and a spate of controversies. "Siddaramaiah wants to inject new and young blood in the cabinet and move some of the ministers for party work in the run-up to the next assembly election, due in early 2018," the party official added.